You will be pleased to know progress is being made on the Kampen Bovenkerk Hinsz set. I wanted to share a small beta demo which uses only 6 stops, 4 manual and 2 pedal building up a very small plenum with Prestant 8, Octaaf 4, Mixtuur and Trompete 8, then Subbass 16 and Octaaf 8 in the pedal. Please note, the acoustics here are all natural with no additional reverb or convolution etc. added prior or post production to the samples. Also the demo is done from a MIDI file, while a decent file it certainly is not the same as a live performance which we will of course plan to have plenty of once the set is released. A note about this sample set...We will be offering it in several volumes beginning with a 2 manual version, then a 3 then a 4. In this way those they may not be able to either a) afford the entire organ or b) load the entire organ, will still be able to obtain smaller subsets with specialized organ files to load the sets with a custom specification. Each successive volume will require the previous volume(s) to have been purchased since they build on to the next. Thus once the complete set is done users may obtain all of the volumes and have the full Bovenkerk instrument at their disposal! Progress is still underway, but we hope to have Volume I available in the near future! Last edited by B. Milan on Mon Jun 09, 2008 3:29 am, edited 1 time in total. Good to see you are keeping busy!! I look forward to the final instrument. Love that mixture. A thought - as most of us(?) seem to have 3 manual consoles, and with all the recent third party modifications of 4 manual ODF's, would you consider offering an extended ODF with the full instument to natively fit a 3 manual console?? Keep up the good work. Just remember althought late nights and coffee overdose is not good for the health, it is good for the soul!! Brett that demo better than a whole lot of commercial CDs! Great job and starting to save. dadams wrote: Brett that demo better than a whole lot of commercial CDs! Very impressive ! I think I have found my future instrument ! be available. Thank you, Brett. Thank you for all the compliments so soon! More details will made at a later date concerning manual coupelrs etc. We are aware that many people do not own a 4 manual console, so we'll work with that to make that 4th manual (4 stops) easily accessible from 3 manuals. The picture I posted above was taken from your exact spot on the organ loft. Good to know we've shared the same ground, even if years apart. Wow Brett, this sounds fantastic. Excuse my ignorance, but how do you create a midi file like this? For MIDI - you would typically have one track per manual, then it's just a case of inserting the appropriate program changes to engage / disengage the stops during playback. You can start with a MIDI file and add the program (stop) changes to it either manually, or by playing back the MIDI whilst recording stop changes. You can record the whole performance in one go - i.e. recording the key and stop changes as MIDI in realtime. Congratulations on the Eb Prelude. Sample set eagerly anticipated. Thanks Geoff and Ian, much appreciated. I am excited about this sample set. It sounds like the baroque instrument I have been thinking about. Besides that -- Bach's St. Anne's is a favorite of mine. It was great to hear a piece that I know intimately sound so brilliant on a few stops. I will be anticipating its release! Picking up on an exchange earlier in this thread (about how one creates a midi file like the one Brett has used for this demo) I've only today caught up with what can be done with the Midi Sequencer version of Hauptwerk to create and then edit midi files. Previously I've only used the Hauptwerk standalone version. I doubt I'm the only one out there who is (or was) blissfully ignorant of the wonderful things you can do with the Sequencer version, like recording pieces and then adding stop changes later on, or even correcting mistakes you've made when recording by editing the midi file! If anyone felt able to offer a "these are the things you can do with ..... " tutorial, I'm sure that would be very welcome. I still haven't managed to work out how to apply reverb in the (Reaper) sequencer - any tips on that would also be very welcome. I've redone the Bach St. Anne's Prelude beta demo with the score in hand and more along the lines of how it should be now that more ranks have been added to the Bovenkerk virtual organ. I think you'll find there is a huge difference now compared to the first demo above since more upperwork ranks have been added (not to mention the Pedaal Bazuin 16). Last edited by B. Milan on Mon Jun 09, 2008 3:43 am, edited 2 times in total. A Bach Prelude is happiest with its counterpart. Hi Brett, thanks for the new demo, it sounds great! At first, I wasn't so sold on the idea of the Kampen because it didn't have the eclectic tonal palette commonly found on American Classic organs, but after closely listening to the demo, I've decided that the tonal philosophy (lots of mixtures) of the Kampen organ has its own appeal. I have a couple of questions regarding the new structure of this sample set. I'm excited about the way it will be done using expansion packs since it will mean we'll be able to get our hands on the sample set sooner. I do have one concern though. 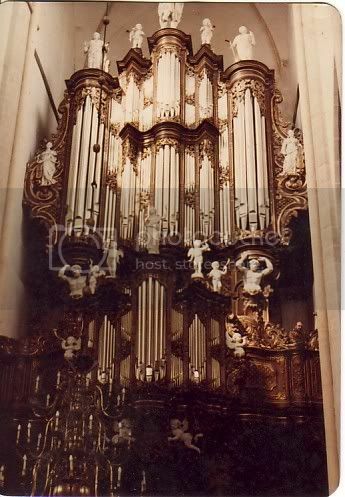 I suspect that the entire organ could be quite expensive if done in a modular fashion. I know you haven't nailed down the pricing, but could you say if you see the Kampen organ having roughly the same price per virtual rank as the Metz for example?